On Monday 25th April, BioPharma Engineering was delighted to donate a cheque for €1500 to the "Brothers of Charity" group in Ballincollig Cork Ireland. The Brothers of Charity group provides care for children between the ages 1-6 years old who have intellectual disabilities. 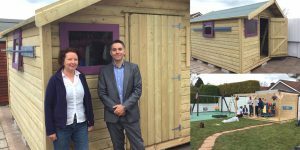 The donation was used for the purchase of a much-needed garden shed to store all their garden toys and bits and pieces. This was part of a larger initiative on the day to upgrade the facility. 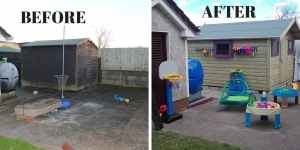 The group was also supported by a team of volunteers from Alcon Laboratories in Cork, who worked to re-do the garden play area. Altogether a total of €5,500 was donated as well as much needed volunteer time. Well done to all involved, we were delighted to have been a part of this particular facility upgrade and look forward to partnering again.